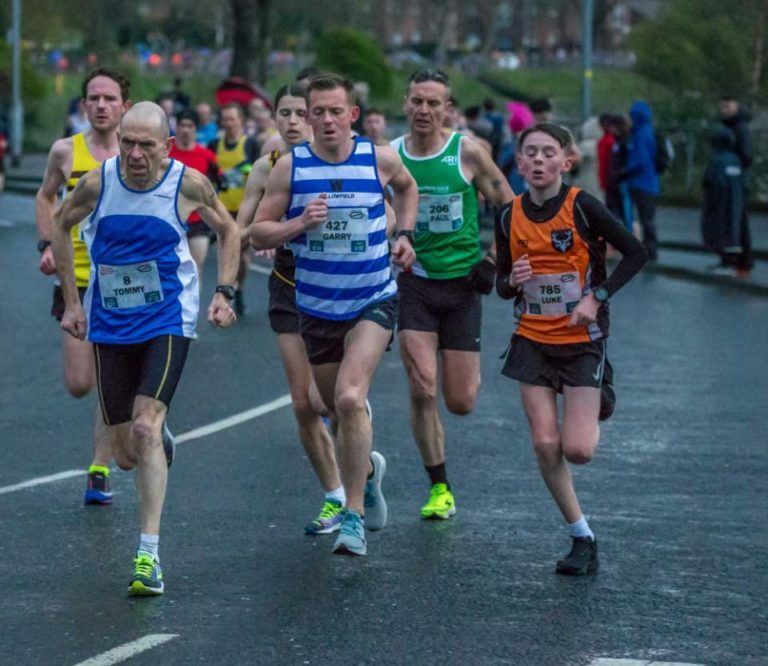 DEEP RIVER ROCK QUEEN’S 5K RACE AROUND THE RIVER & NI & ULSTER CHAMPIONSHIP, 3rd April 2019. After pleasant weather at the Larne Half Marathon in late March, early April had turned changeable and cold (some might say awful). At least there was a lot more daylight than last year. Despite the conditions, Orangegrove AC were out in strength for round 4 of the club championship with 54 runners on the start line and 53 finishers after Rachel Woodman had to stop after 3K through illness. Maybe the film Ben Hur (1959) made a big impression on me at a young age, but it comes to mind at the start of this race as hundreds of runners go off at a hectic pace along Annadale Embankment. If you remember the famous chariot race in the film, Messala (the badie) played by Newtownabbey man Stephen Boyd, comes to a sticky end under wheels and horses’ hooves – I suppose that is the danger of not having top billing. After reaching the shadow of Dunnes Stores in one piece, you can breathe a bit easier and take in the view of the runners flowing over Ormeau Bridge and turning left along Stranmillis Embankment towards King’s Bridge. There are no DRS zones in this race, but human muscle power is still impressive. However, people were running in the cycle lane and on the riverside footpath, instead of on the road where the course had been measured. A bit more marshalling is needed here next year I think. Luke Harte won the Orangegrove battle in an impressive time of 16:50, 68th out of 731 runners. Andy McIntyre was second in 16:58, 79th place. Michael Broadhead was third in 17:17, 97th place and Andrew Tees was 4th in 17:20, 98th place. Gemma Blake was first Orangegrove lady in a personal best time 20:29, 281st place. Edwina Ternan was second in 20:58, 310th place. Julie McKimm was third in a personal best time of 20:59, 318th place and Pauline Bayliss was 4th in 21:10, 335th place. In the NI & Ulster Championship, the OAC ladies came 11th and the OAC men came 16th (first 4 scoring). The race was won by Neil Johnston (Springwell Running Club) in 14:50. Declan Reed (City of Derry Spartans) was second in 14:58 and Chris Madden (City of Lisburn AC) was third in 15:02. Nakita Burke (Letterkenny AC) was first lady in 16:49, 63rd place. Kelly Neely (City of Lisburn AC) was second in 17:01, 82nd place and Sarah Lavery (Beechmount Harriers) was third in 17:06, 83rd place. Thanks to Queen’s University and ChampionChip Ireland and all the supporters, especially the ones from the club. 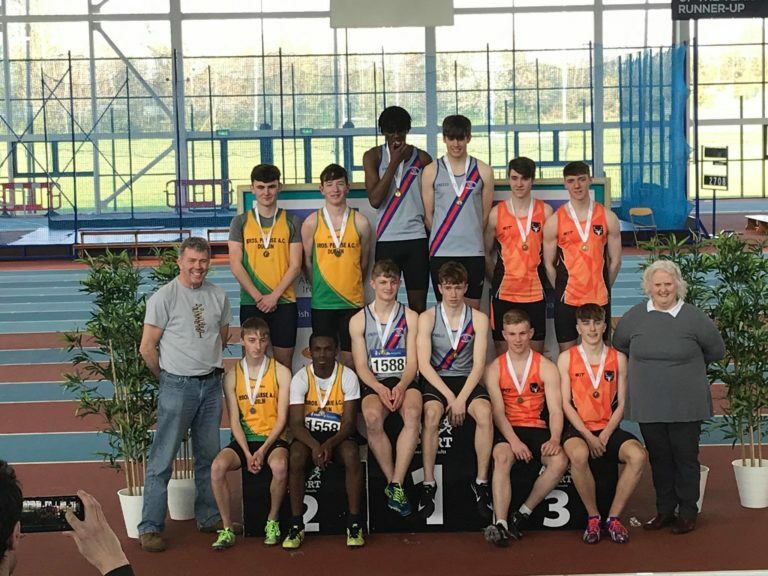 Orangegrove AC put in a strong effort and no doubt will be back to try even harder in 2020. Luke Harte, 16:50; 2. Andrew McIntyre, 16:58; 3. Michael Broadhead, 17:17; 4. Andrew Tees 17:20; 5. Gavin McGucken, 17:34 (PB); 6. Keith Weir, 17:46; 7. Jonathan Weston, 18:47; 8. David Gribben, 18:52; 9. Robin Montgomery, 19:10; 10. Ryan Kerr, 19:18 (PB); 11. Rodney Corrigan, 19:20 (PB); 12. David Fletcher, 19:26 (PB); 13. Michael O’Donoghue, 19:45; 14. Des Fahy, 19:53; 15. Darren Houston, 19:59; 16. Tom Smith, 20:02; 17. Gemma Blake, 20:29 (PB); 18. David Montgomery, 20:40; 19. Ian Grant, 20:45; 20. Brian Todd, 20:56; 21. Edwina Ternan, 20:58; 22. Julie McKimm, 20:59 (PB); 23. Martin O’Brien, 21:02; 24. Pauline Bayliss, 21:10; 25. Robert Hill, 21:30; 26. Chris Woods, 21:42; 27. Gillian Logan, 21:48; 28. Caroline Beattie, 23:00; 29. Andrew Bennett, 23:07; 30. Kimberley Reynolds, 23:09; 31. David Gilliland, 23:18; 32. Alison Canning, 23:48; 33. Jacqueline Maxwell, 24:09; 34. Verity Cornford, 24:14; 35. Gerald Harvey, 24:21; 36. Anna Rankin, 24:24; 37. Jill Holland, 24:27; 38. Peter Grimley, 24:45; 39. Harriet Anderson, 24:51; 40. Adrienne Savage, 24:54 (PB); 41. Reg Sanlon, 25:00; 42. Judith McCann, 25:10; 43. Jenny Powell, 25:17; 44. Conor Walker, 25:20; 45. Emily Paisley, 25:21; 46. Martin Walker, 25:26; 47. Iseult Fahy, 25:49; 48. Selina Myles, 26:17; 49. George Gribben, 26:35; 50. Roy Skillen, 26:56 (PB); 51. Jim Harris, 27:55; 52. Hannah Montgomery, 30:09; 53. Lisa Nevin, 30:29. Saturday was the day of the Grand National Steeplechase. On the flat, a 6.9K course is no problem to a race horse, but the jumps are a different matter. Luckily, there are no really large obstacles in the way at parkrun, just the odd dog or pram or puddle. At a sunny Victoria Park, Luke Harte ran very well to finish second and was fastest of the OAC group. 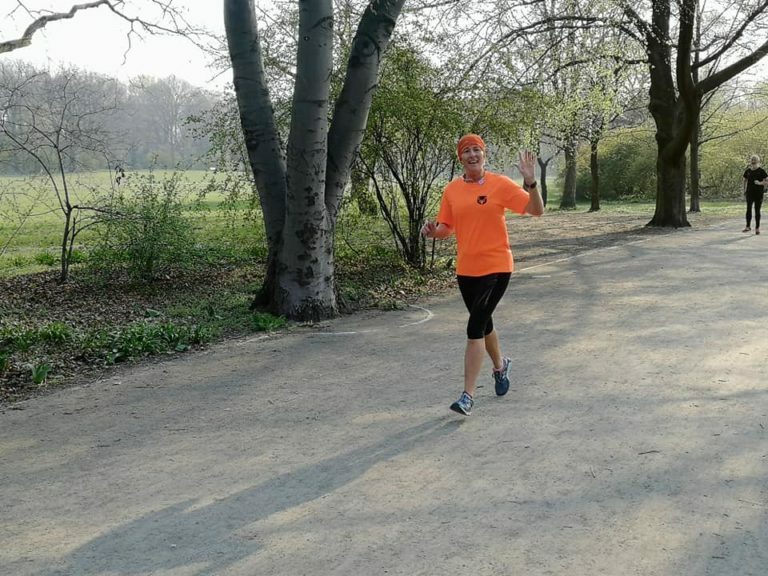 Excellent 5K running for the second time this week. 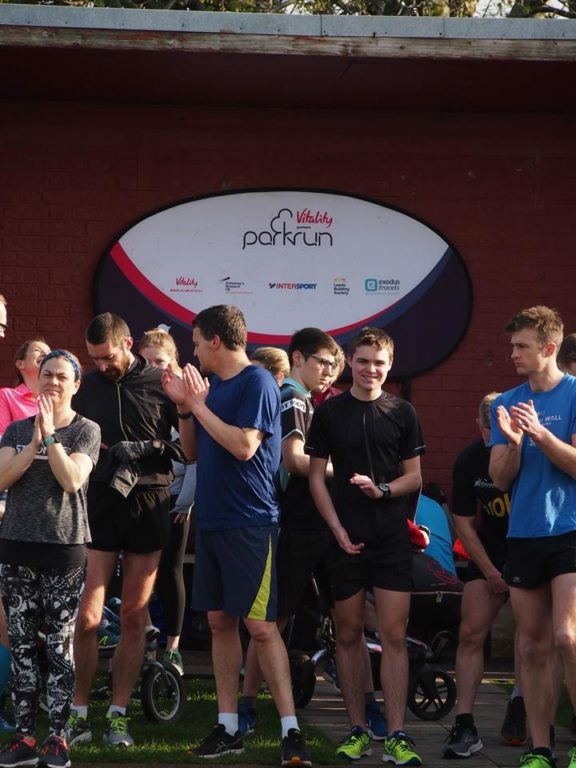 PB times this week: Belfast Victoria Park: Danny Bradley, 18:47; Roy Skillen, 26:46. Stormont: Gillian Logan, 24:08. Orangefield: Ross Robinson, 20:22. First Timers: Waterworks: Selina Myles; Stretford (England): Verity Cornford; Hasenheide (Germany): Brian McFarland, Beverley Martin and Sharon McFarland. Saturday evening saw the eighth running of the Patsy Kelly 5K race in the Co. Louth town of Dundalk. Patsy Kelly was a stalwart of the local Clan Na Gael Gaelic Athletic Club and the North East Runners AC. He died before his time in 2010 while out running with his friends. In recent years this race in his memory has become one of the premier 5K events in the Republic of Ireland. 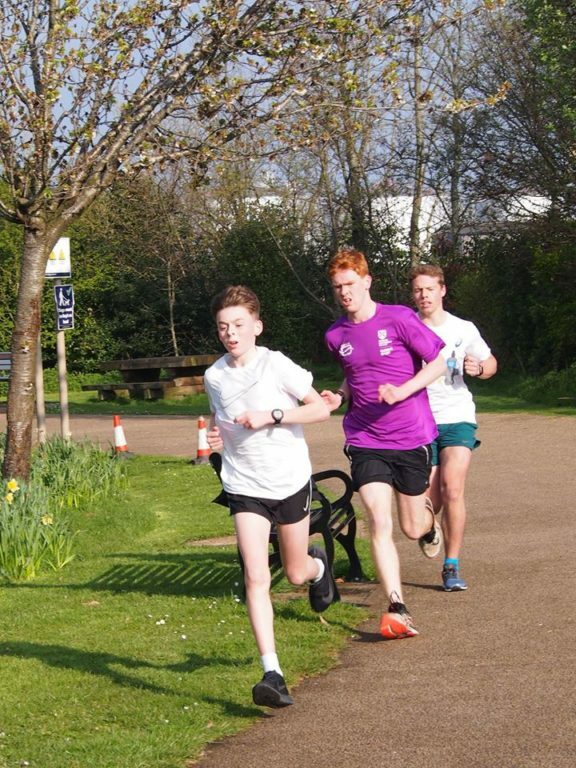 The course is a quite speedy single loop to the west of the town comprising a very fast start and finish with a moderate incline in the middle. Over 800 people ran in what is, unusually, a Saturday evening race. Brian Todd (a local boy) and Michael O’Donoghue made the trip south by train. The start line is a short distance from the magnificent Victorian Dundalk Railway Station. Michael had spent the earlier part of the day on a treadmill raising money for Combat Cancer, which was probably not the best preparation for a speedy 5K. 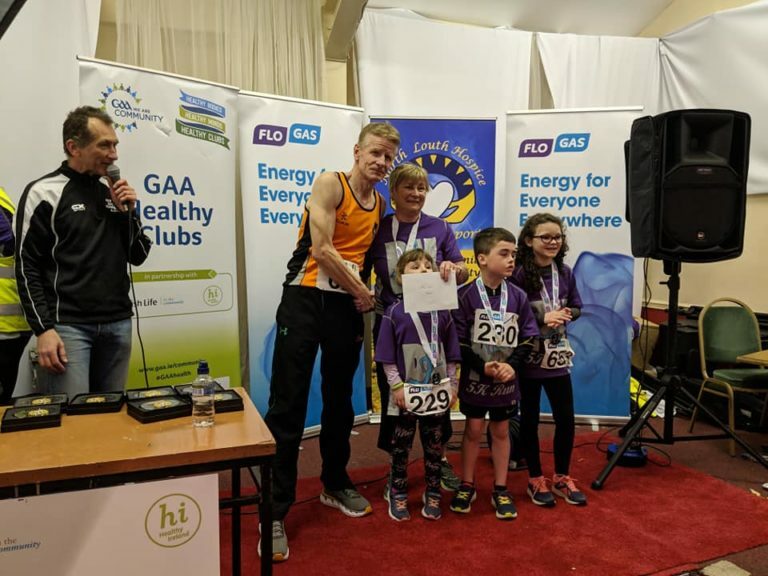 In the end the Patsy Kelly 5K was won by Darragh Greene (Dunleer AC) in 15.24. Hazel Hughes (Shercock AC) was first lady in 18.47. Brian Todd…20.49 (3rd Over 60 category prize). As usual there was a magnificent culinary spread in the Clan Na Gael clubhouse following the race and both Brian and Michael enjoyed a pint or two in the Railway Tavern before catching the last train back to Belfast. A long old day! Next year we may well need to apply for a visa to run the Patsy Kelly 5K!!! Proceeds from the race were donated to the North Louth Hospice. SPAR OMAGH HALF MARATHON, 6th April, 2019. Well done to Emily Paisley, the only OAC runner in a field of 2,297 runners, on finishing in a time of 2:13:11. The race was won by Gary O’Hanlon (Clonliffe Harriers) in 1:07:40. Laura Graham (Mourne Runners) was first lady in 1:16:31, 13th overall. 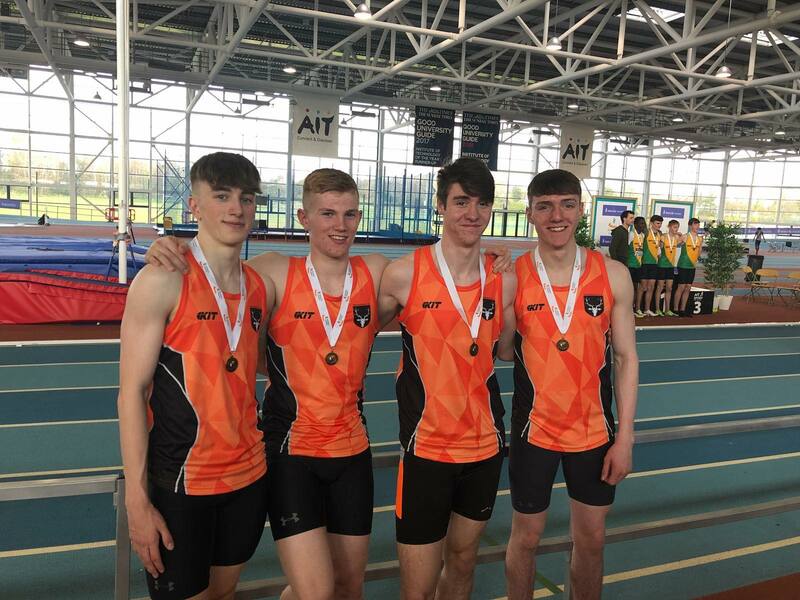 In the U18 4x200m Relay final at the InternationaI Arena, Athlone, the OAC team (Nathan Stewart, Roy Carson, Adam Sykes and Joseph McNaughten) finished third after an up and down battle, setting a personal best time of 1:33:31, nearly 4 seconds faster than their previous best. Those bronze medals must have made the 3 hour journey home a bit easier. Great running. 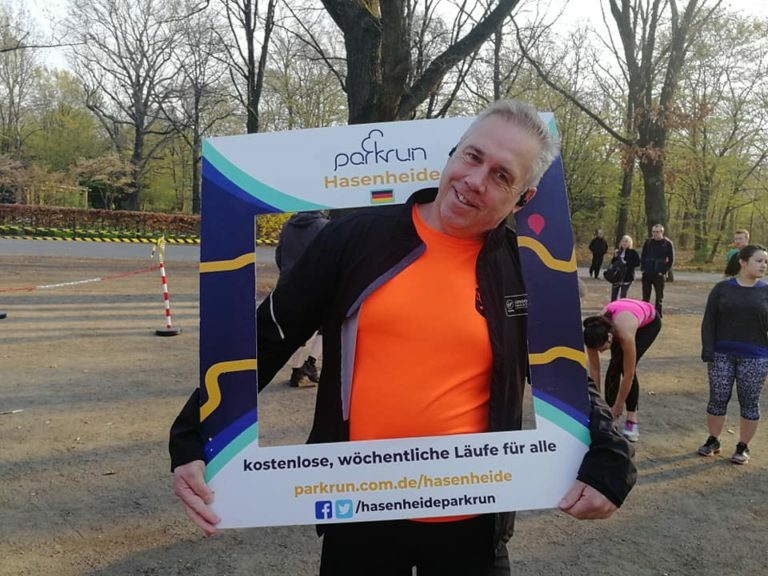 GENERALI BERLIN HALF MARATHON, 7th April, 2019. Five OAC runners took part in aid of the Kevin Bell Repatriation Trust. The race was won by William Wanjiku (Kenya) in 1:01:00. The male podium finishers were covered by 2 seconds! First lady was Sifan Hassan (Netherlands) in 1:05:45. There was a total of 28,444 runners competing. OAC Results: Alan Martin, 2:05:48; Brian McFarland, 2:15:48; Ian Wilson, 2:17:04; Mairead Napier, 2:25:55; Beverley Martin, 2:33:15. Well done folks. Photo of Luke Harte at the QUB 5K by John Glover.